Smoothies can provide all sorts of benefits. Our comparison chart spotlights 20 restaurant choices and selects the 9 best—and most healthy—smoothies. 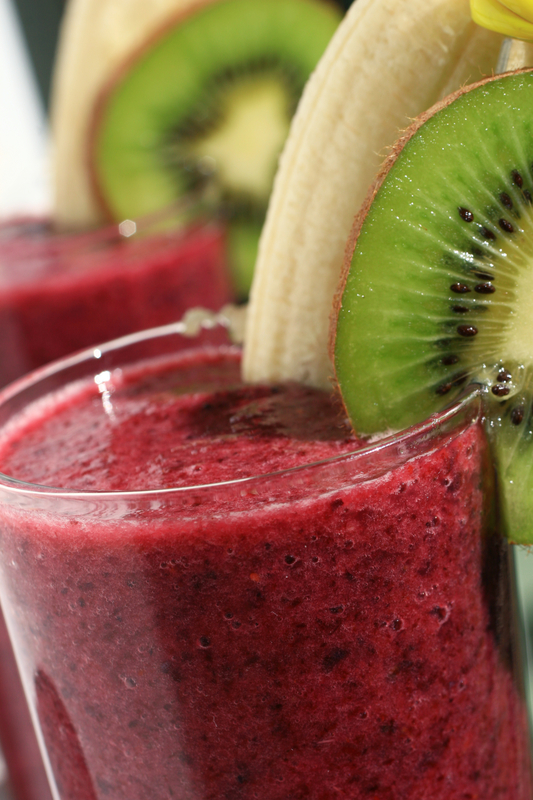 Healthy smoothies can provide a boost in the morning or mid-afternoon. But not all smoothies you can buy in restaurants are healthy. 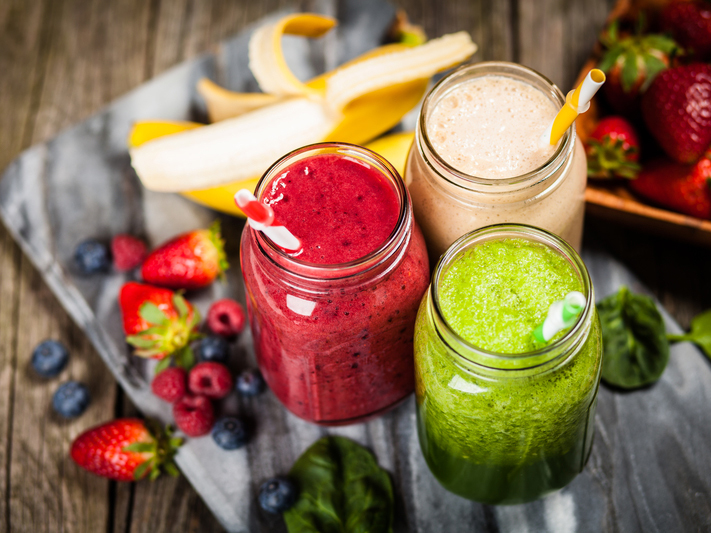 If you own a blender, you may already know that healthy smoothies make a perfect meal to start your day or to fuel your afternoon. More and more restaurants are offering smoothies these days, too. When fruit and veggies are blended with yogurt or milk, they combine to boost your vitamin, mineral, fiber, antioxidant, and protein intake, right? Not always. If you’re buying a smoothie at a restaurant, take a close look at the ingredients. To be fair, some smoothies you can buy at restaurants are healthful. Others, though, are loaded with ice cream and sweeteners but skimp on the nutritious ingredients—yogurt, fruits, and vegetables. Restaurant smoothies are one thing; making your own with fresh fruit—in this case, bananas, kiwi, and strawberries—is even better. The most nutrient-packed smoothies contain whole fruits and vegetables (not juice) along with non-fat yogurt (preferably Greek) or milk, with little (or no) added sugar. These healthful ingredients, of course, contain naturally occurring sugar. So gauging a smoothie’s healthfulness using only the grams of sugar printed on a label, can be deceiving. Fiber content can be a better indication of the presence of fruits or vegetables, as well as protein—a marker for yogurt or milk. Check out the calories as well. Even if a smoothie provides fiber and protein, you don’t need to be drinking the caloric equivalent of two fast-food deluxe cheeseburgers (nearly 1,000 calories) in a small drink. For more on nutrition and healthy eating, see this selection of University Health News posts. The next time you belly up to the smoothie bar, keep these tips in mind. Good things come in small packages. To help keep your calories and sugar in check, choose the smallest size possible, or split a smoothie with a friend. Look beyond the name. Don’t let terms like “wellness,” “fitness,” or even “low-fat” make you think certain smoothies are healthy choices. They can still be high in sugar and low in fiber. In fact, at one restaurant we surveyed, smoothies labeled “low-fat” had significantly more calories and sugar than those without this special claim. “Why” matters. Let the mission for your smoothie guide your choice. If the smoothie will serve as your breakfast, choose a high-protein, high-fiber option to help keep you satiated longer. For a midday snack, look for low-calorie and low-sugar smoothies. 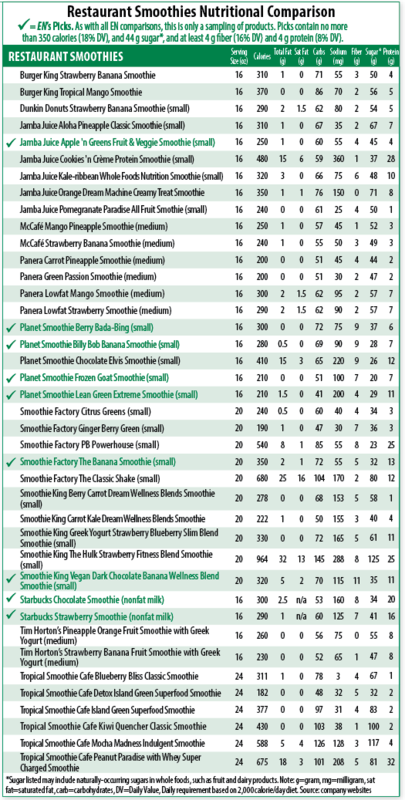 The nine smoothies with a checkmark to the left are the top restaurant choices per research by Environmental Nutrition. A select few on the chart approach 1,000 calories. 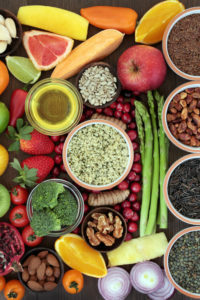 antioxidant, breakfast, calories, complete nutrition, diet, fast food, fiber, fitness, food, health, health news, healthy eating, healthy eating plan, healthy fats, healthy smoothies, milk, nutrition, nutrition diet, protein, smoothie, sugar, university health news, vegetables, vitamin, what is nutrition, yogurt.